At the age of sixteen she made her debut playing Mozart’s last piano concerto with the Simón Bolívar Orchestra under the baton of José Antonio Abreu; from then on Clara Rodriguez’s career as a concert pianist has taken her to perform in most European cities, India, Egypt, Tunisia and the Americas. Her discography under the Nimbus label includes CDs of the piano music of Venezuelan composers Moises Moleiro, Federico Ruiz and Teresa Carreño; Her catalogue also includes El Cuarteto con Clara Rodríguez en vivo; the piano works by the Cuban composer Ernesto Lecuona, Late works by Frederic Chopin and her latest album “VENEZUELA” which was reviewed by Gramophone thus: "Clara Rodriguez makes the most of her innate feel for the exuberant and languorous, dispatching the toe-tapping cross-rhythms with panache and a light touch. This is a treasure chest from which to cherry-pick." She regularly plays in London’s Wigmore Hall, Saint John’s Smith Square, Southbank Centre, Barbican and at the Bolivar Hall. Clara is known for devising concert programmes with intriguing titles-and content- such as her highly successful Latin-Bach and Tangoitys, and the shows Con-cierto humor, Gypsy Ballade (dedicated to Federico Garcia Lorca) and Liszt in petticoats (dedicated to Teresa Carreño) in which the piano music is interspersed with drama and visual effects. She has also presented Clara Rodriguez and her African Heart at Royal Festival Hall. Clara is regularly invited by the media as a guest to talk about her projects and to play live. Some of the latest coverage of her work includes appearances on programmes such as Performance on 3 with Martin Handley, In Tune (BBC Radio 3), Tonight at 11 with Nathalie Wheen (Classic FM), Woman’s Hour (BBC Radio 4). 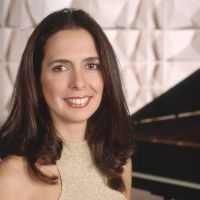 Clara Rodriguez is a piano professor at the Junior Department of The Royal College of Music of London.